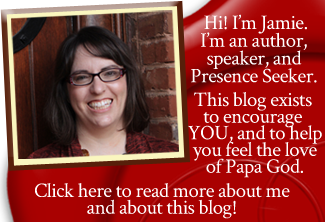 Do you feel paralyzed by life circumstances, drowning in a sea of things pressing in on you? If so, I have an encouraging word for you today! First, I know what it is to feel paralyzed by life circumstances. And did I mention a job that is 24/7? Yes, I love my job. I love this ministry. It’s my life’s work. But it presses on me 24 hours a day, seven days a week. On top of that, we just finished a big event. 60 people got delivered and set free. It was amazing, and worth every sacrifice. But it was hard work. And now we’re headed into another event–our Ireland mission trip–and also my husband and I are going to a blogging conference this coming week to learn as much as we can about how to reach more people for Jesus. To be perfectly honest, I’ve been feeling paralyzed by these things. But you know what? Over the last few days, Holy Spirit has been discipling me through–and I want to share the nuggets He has given me with you today. Stuff infringing on your physical space infringes on your emotions too. Our baby sleeps in our room, so that requires baby stuff to be in our room too. This equals A LOT OF STUFF. Stuff in addition to the standard adult stuff. As I have been praying about how to get rid of this paralyzed feeling, Holy Spirit showed me that the stuff in our physical space really takes a toll on my emotions and on my peace. And when I refer to my emotions, it’s not like I’m upset or anything. It’s just that I can feel All The Stuff pressing on me. So Father told me to purposefully take five minutes and clear out some stuff. I sat down to do this, and suddenly five minutes felt so good that I kept going. My mother (who lives with us now) played with our son for a few minutes and I ended up taking about 15 minutes to clear out stuff. After about 15 minutes, it wasn’t done–but it sure looked and felt better. I don’t have Scripture for this, but I’m asking the Lord if it’s in the Bible somewhere. I don’t know yet; I’ll let you know if/when I find it. But somehow it seems to be true (in my experience, anyway) that physical stuff taking up physical space infringes on your thought life. Maybe it’s just that every time you look at it, your brain has to process the images–and therefore it DOES require mental energy to have the stuff there. That would certainly be a basic scientific truth. Other than that, I don’t know–but I know I feel more at peace WITHOUT stuff to look at than I do WITH stuff that requires me to look at it. Do you feel paralyzed right now? If so, take five minutes and clear out some stuff. Open up some floor space at home or some desk space at your office. Do what you need to do to reduce the images you have to process in your thoughts. It will help! Next nugget: The enemy has been trying to derail you. Get mad. your relationship with that person can be preserved. If some other situation derailed you, confront the enemy about it by submitting to God and resisting the devil. Draw near to God, and tell Him what you need help with. Ask Him to help you get it done! I have had several projects lately that were just HUGE and big and intimidating. I just wasn’t able to find the gumption to get them done, but deadlines were looming. And you know what? I felt Holy Spirit’s hand on my back, guiding me into my office to sit down at my computer and open up the project. Then He showed me each step to take. His guidance and help were so clear and tangible. I felt helpless and intimidated by the thought of finishing the project, but I didn’t feel helpless or intimidated at the thought of obeying Him as He prompted me. So I obeyed. One step at a time, I let Him create through me. And you know what? A few hours later … finished project! Beloved, the enemy has been trying to derail you. Get mad at the enemy and decide to bring even more glory for God. Ask Father God for His help and DECIDE to follow Him as He helps you press through. And He will! Nugget 3: It’s time to go back to the list. Y’all, I am a huge goal fiend. I love goals. I have them written out and I keep them in front of me on vision boards. Goals make things happen! But, it has been awhile since I functioned on a daily basis from a list. I have longer-term goals, but I haven’t been working from a list of daily goals. And when I did, it made all the difference in the world. So this morning, the Lord is telling me to get out my planner again. (It has been in the pile of study materials on the floor. You know, the pile I mentioned above that takes so much mental energy to look at.) 🙁 And before I finished this article, the Lord made me and helped me make a list of what I need to do today and over the next few days. Beloved, lists are Biblical. They are both practical and full of Biblical truth. You’ve got to write that vision (Habbakuk 2), that they may run who read it! You will run when you read it. Angels will run when they read it. Other people will run if you have a list for your family. But we’ve got to write that vision! “Father God, in Jesus’ name, thank You for hearing my prayer right now. Father, I feel paralyzed. I feel like all the things are pressing in on me, and I can’t seem to overcome it on my own. Father God, I need help. I hand these things over to You. I hand myself to You once again, and I ask that You would pour out Your strength and grace on me right now. Father, please help me to confront the issues I need to confront. Help me to get rid of stuff I need to get rid of. Help me to forgive like Jesus forgives, like You forgive. Help me to clear out the clutter, even if it takes me days to do it. Help me to start. Help me to take small steps. Father God, please work through me. You see what I need to get done. Please fill me with Your Spirit. Take my hands and feet and use them as Your hands and feet to do Your will. Help me to receive Your truth that I can do all things through Christ who strengthens me. Father, please lead me. Guide me. Work through me. Help me to make a list of all the tasks I have to do, and to write down daily, weekly, and monthly goals. Help me to carry out Your purpose and to be single-minded in focus on what You have ordained for me. Help me to seek You first and seek Your Kingdom and Your righteousness, and all these things You will add to me. Beloved, now go after it. I understand the urge to give up. I understand the urge to sit down and do something fun that blocks out the stress. I understand the urge to go to bed early and zone out. But you know what? What you do is important. Your call is important. Your place in the Kingdom is important, and you’re going to have to push through if you want to live out the fullness of blessings God has for you. So kick the paralysis down. Get mad at the enemy. Get back on track, and take small steps forward. Do these things TODAY. 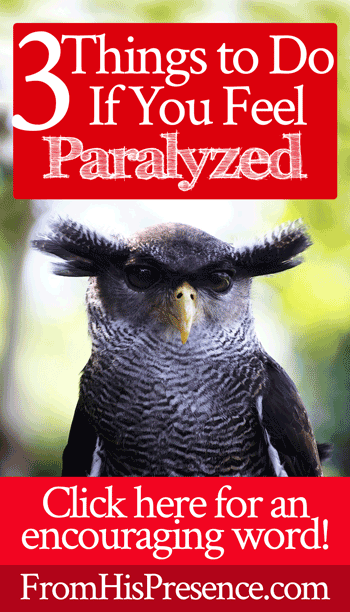 Have you been feeling paralyzed? If so, will you take the situation by the horns and overcome it today? Please leave a comment below–and I am praying for you! Hey Misty. Condemnation is NEVER from God. Romans 8:1. When people abuse you in the name of God, it is both a lie and abuse. When people embrace lies, there is nothing you can do except pray for them because their heart has to be open to receiving truth. Remember it’s Holy Spirit’s job to lead people into all truth, not yours. Yes, witness. Yes, pray. But when people reject your witness, Jesus said to shake the dust off your feet and move on. Matthew 10:14. He also said not to throw your holy things before the dogs or cast your pearls before swine. Matthew 7:6. Misty, some people don’t want to be free. With freedom comes responsibility. Rules and regulations give some people comfort. And when people are wounded, putting rules and regulations on OTHER people gives the wounded person comfort. It’s a spirit of control and of many other things. Bullying makes wounded people feel bigger. I believe in the local church. I love the local church. I attend one faithfully, and I serve the local church with this ministry. But I put my efforts toward local churches who believe God’s Word–and only God’s Word–not behind people who try to enforce their version of what God’s Word says, which it really doesn’t say at all, and is therefore a lie. Spiritual abuse is real. Everything called “spiritual abuse” isn’t, but when it doesn’t line up with the Word, it is true abuse. It can be very destructive. If you or anyone reading this is being abused, RUN! And find a place where they are doers of the Word, and not hearers only. Thank you Jamie, this all makes perfect sense because I know our Father is a Father of love and mercy and grace. I was just trying to make sure that I am not over reacting and thinking that it is spiritual abuse and it’s not like you said I don’t want to call it “spiritual abuse” and it’s not. I started to feel like I was in a relationship and making excuses for the way I was being treated. I felt much like a woman who is in an abusive relationship and believes that there are valid reason for the reason she is hit and told what to do and how to do . Yes, it hurt but the hurt I am healed from I just want to make sure moving forward that I recognize signs of spiritual abuse. I can not wait to get the “Conditional Love” teaching!! Wow this just happened to me at the Voice of Healing Conference 2018! I got kicked out by the DELIVERANCE team for MANIFESTING! I’ve never manifested before! I may have had signs leading up to it this year, minor signs, and didn’t know what they meant. I too got set free of MANY demons, generational curses, lies, and fears. I felt so much more empowered now to walk in my identity with Christ. The 2 ladies that kicked me out didn’t pray for me or encourage me which confused me as Christ always stopped for the one. I forgave them repeatedly. After it was over and I stood outside with a friend who met up with me later, I said out loud “I shake its dust off my feet from all bitterness and anything trying to transfer over.” INSTANTLY Holy Spirit came down on me and I nearly fell over. My friends, including people working there at the conference, said what happened to me with the whole getting kicked out thing was bizarre, but they are aware that those women have some open doors left open that they’re not wanting to close and are still people. It hurt, because my spiritual brother told me to go up to a specific person and lovingly tell them I forgive them, and walk away. So on the 3rd night of the conference I prayed over and over for Holy to give me the right words that I may bless them. And give us a Truth Encounter is what I said. He gave me one. I manifested in the back of the auditorium, I was pulled out and guilted for “holding my friends back from being with God and holding back the staff from helping everyone else when they’re stuck with just one person.” My point is, my ‘confrontation’ didn’t go as sweetly as I planned. Deliverance is new to me and it was scary (but freeing and made me SO much better as I was blessed with new Eyes to see even MORE love on others.) I keep trying to make sense of it. There are people in my life or who crossed paths with me that I forgave and I repented on my behalf as well. I blessed them and everything. It changed me. But I see no repentance or changes on their behalf. My question is do I keep pressing in? Or do I leave them alone and get them off my mind? Even visiting family is no longer a comfort and more of a battle zone. And the closer I’m getting to Him, the bigger the battles are from my family. I didn’t even retaliate. I just prayed silently and praised Him gently, sincerely, and out loud. And the battles increase! I get mocked, yelled at, laughed at. I guess I feel responsible for the outcome of others sometimes and it hurts me. They too have free will, but somehow I feel like I’m supposed to step over that and save them. Hi Sabrina. Did you renounce agreement with the demon that was manifesting through you, repent of allowing it, command it to leave you in Jesus’ name, and ask Father to fill you with His Holy Spirit? If not, please do that so you can be free from whatever has been tormenting you. I just thank God for what I have- husband, baby, job, mother and all that goes with the lot. Thank you yet again Beloved Sister-in-the-Lord! Thank you for being real with us and true and oh so tenacious in all things. I was not able to attend the recent awesome conference but the posts you shared were more than enough (mother & father blocks, inner healing). I was able to glean from your posts and begin a new walk with increase in faith, hope and the Love of God in Christ. Be even more BLESSED TO BE THE BLESSING in JESUS HALLELUIA!!! Thank you for your message .I have felt the same way for over 3 months about so many things ,especially my writing children’s stories I have just not moved forward.I would like to be vulnerable and mention one of my characters Dr Hoot looks exactly like the owl with tufts on this message could it be Father saying something to me .i could be wrong but I leave every thing in his hands. Boy! God sure knows how to confirm what He is saying to me, what I have wanted to avoid hearing. Thank you for being transparent and allowing us to see your struggles. You have such a strong, powerful message, Regina. The enemy is waging all-out war to keep you silent. I speak and command “grace, grace to you” in Jesus name! Lord, strengthen the work of Your hands, in Jesus’ name! I have been seeking direction from God about exactly this same area. Paralyzed to ‘start’. I’m pressing in seeking a ‘reason or the root’ of why I struggle in this. I’ve done lists, I’ve input scheduled timers on my phone but there is this underlying ‘something’ from which this paralysis stems, and THAT’S what I need revelation for, to be free once and for all. I have discerned that it is some kind of fear or escape mechanism, but I press in to know ‘what’! Thank you Jamie for always being so real and vulnerable with us. God bless you. Hi Debra, thanks so much for sharing this. Just some thoughts to consider as you’re working through this with the Lord: When was the first time someone told you that you would not prosper/finish/be good enough? If you can identify that, the Lord will often show you a root there. Also, did your dad ever bless you to succeed? Failure to finish/thrive/succeed can be an issue with roots in childhood or even infancy. Let me know if you have questions about these couple of thoughts. They may not be the problem at all, but they could be, so I thought I’d mention it. Hi Jamie, the verse that immediately came to mind about the clutter is Psalm 31:8. “You have not given me to the hand of the enemy but you have set my feet in a wide open space” – for me, seeing clutter creates anxiety which is paralyzing. I have been working on this for a while now (trying to declutter a small house with 4 children AND trying to get them and hubby on board with the clutter-free vision is not accomplished or established overnight, however every little bit helps. Learning to Celebrate progress not perfection! ? Love that verse! Great thoughts – thanks!! I just read the title of your message and it describes me perfectly right now. I am single, 57, and have recently lost both of my parents. I have no children. I have always worked and God has always provided more than enough for me to be able to give to others. However, recently, the day I lost my stepfather, the job I was working at decided to get rid of me. They packed up my things while I was out, and told my contracting company that things were just not working out. The truth is, that they had not trained me at all, and there were some other dysfunctional things going on. However, God knows I need a job and insurance …. and it has been difficult to find one in my field. I’ve never been in this position before in my life. My health insurance will run out soon, and although I have a savings, it won’t last long if I have to pay for private insurance especially. I’ve been applying since I lost the other job. Please pray that God will bless me with a job that will meet my financial needs and I can continue to bless others. I keep quoting “Perfect Love Cast Out Fear” and “All Things Work Together for the Good”, but I have knots in my stomach from fear. Thank you! I am praying for you now, sis. Here’s also a prayer to find a new job that I wrote. It might help. Yes Jamie. This is necessary- to de clutter. I love it. Thank you. I guess how we do one thing is how we do all things. Therefore order in our homes is good. I have learnt God is looking at how we steward our homes, money, cars, ministry and accordingly we are promoted to bigger and better. It’s all about our stewardship. The bible verse says- if we are faithful in little- He blesses with more. God bless you with more as you are faithful with what you have. Needed this word again.